An Analog Multiplexer is a semiconductor device that combines two or more analog signals and outputs these as one signal. 4-channel, 8-channel and 16-channel Analog Multiplexers are common configurations. In a system design, an Analog Multiplexer can manage the throughput of data from multiple analog input channels to a single Analog to Digital Converter, increasing the amount of data that can be transmitted along the signal path and reducing the number of relatively expensive Analog to Digital Converters required. Analog Multiplexers range from simple, cost-effective solutions for applications such as Cellular Phones, MP3 Players and PDAs to advanced, high-performance solutions for Data Acquisition systems, Industrial Process Control systems and Medical Ultrasound equipment. 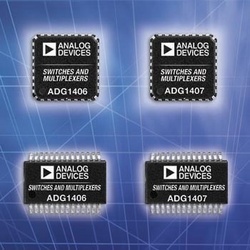 Manufacturers of Analog Multiplexers include Analog Devices, Texas Instruments, Maxim Integrated, Vishay Intertechnology, STMicroelectronics, Linear Technology, Intersil, NXP Semiconductors and Fairchild Semiconductor. Growth in the Analog IC market is forecast to average 10% per year over the next five years. Procure International offers both current production and obsolete Analog Multiplexers from most of the world’s manufacturers at very competitive prices and short lead times. Search for the Analog Multiplexers you need using the Part Number Search bar at the top of this page, submit your RFQ to get pricing, and place your order directly online using our secure online ordering process.